One of the biggest developments in the world of technology over the last few years has been that of digital twins. A digital twin is a virtual replica of a physical system, process or product. The technology essentially provides a real-time look at how a physical asset is performing. Digital twins are already being adopted in industries such as manufacturing, automotive and construction. Consequently, organisations in these respective industries are using digital twin technology to evaluate the performance of given physical assets and then, identifying where improvements can be made to reach more favourable outcomes for the future. Interested in emerging technologies, digital marketing specialists Reboot Online analysed the latest findings from research facilities provider ‘Catapult’, who surveyed engineers (from a range of disciplines) to better understand the components they believe are the most necessary for digital twin technology to function effectively. Reboot Online found that a ‘physical asset’ (71%) is the component engineers think is the most necessary for a digital twin. 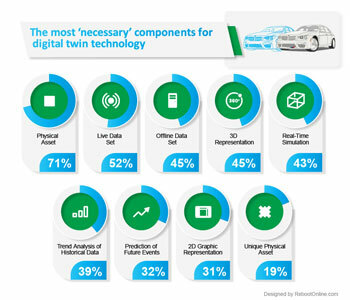 Thereafter, 52% of the experts view a ‘live data set’ as an essential feature for the functionality of digital twins. 45% also believe an ‘offline data set’ is a very important component for the technology. Interestingly, with a digital twin being a pairing of the virtual and physical worlds, just 45% of engineers rate ‘3D representation’ as a must have variable for the technology. On a similar note, 31% state ‘2D graphic representation’ is needed for a digital twin to work properly. Only 39% place ‘trend analysis of historical data’ as a vital attribute for a digital twin. Even less feel ‘prediction of future events’ (32%) is a critical aspect that can push the technology to achieve desired objectives. 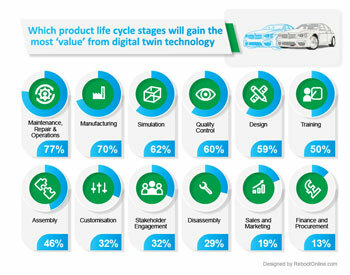 Reboot Online discovered that ‘maintenance, repair and operations’ (77%) is the stage in the product life cycle where majority of engineers believe digital twin technology adds the greatest value. Thereafter, engineers view ‘manufacturing’ (70%) as the next most likely process to benefit from the utilisation of digital twin technology. 62% of engineers think digital twin technology can be harnessed during the ‘simulation’ of a model that predicts the current and future behaviour of a given physical asset. Slightly below, 60% feel digital twin technology can be a highly practical for ‘quality control’ testing. Interestingly, 59% consider a digital twin to be impactful in the ‘design’ phase of a product/system. Contrastingly, ‘finance and procurement’ (13%) is the step in the product life cycle which engineers think will be able tocapitalise the least from the capabilities of digital twin technology. Just above, only 19% of engineers place ‘sales and marketing’ as a key operation which can experience significant gains from deploying digital twins. Naomi Aharony, the Managing Director of Reboot Online commented: “We are in an era of rapid technological developments. At the forefront of that has been the rise and evolution of digital twins. With the technology having the ability to cover the entire life cycle of a physical system, process or product; it provides businesses with a powerful analytical tool which can thoroughly assess key performance indicators and provide insights as to where enhancements can be made. In the long-run, the lessons and suggestions taken from digital twins will drive various opportunities for innovation and growth."